The primary objective of this fundraiser program for the Colleges/ Universities is to educate students and parents about waste diversion and water conservation. The students will have the opportunity to participate by using the compost bins to recycle compostable kitchen and yard residuals. The finished compost or humus harvested from compost bin through the composting process of decomposition is an excellent soil amendment providing much needed enrichment for your soil. It also helps to reduce the municipal waste. Students can also participate by using the rain barrels to conserve water. Natural rain water has the pH level ideal for plant growth. The water harvested is soft, fresh that can be used for a variety of purposes including garden and lawn watering, topping off pools, and washing cars. Rain water harvesting also helps to divert rain from storm drains, decrease the impact of runoff to streams, and minimize sewer overflows during heavy rain falls. Setting up a program can be done in three easy steps. First step: The College or the University has to show interest in participating in this fundraiser program. Second step: Plan and customize a fundraiser program with the College/ University. The students and parents must order their product in advance to ensure availability on the day of the distribution event. 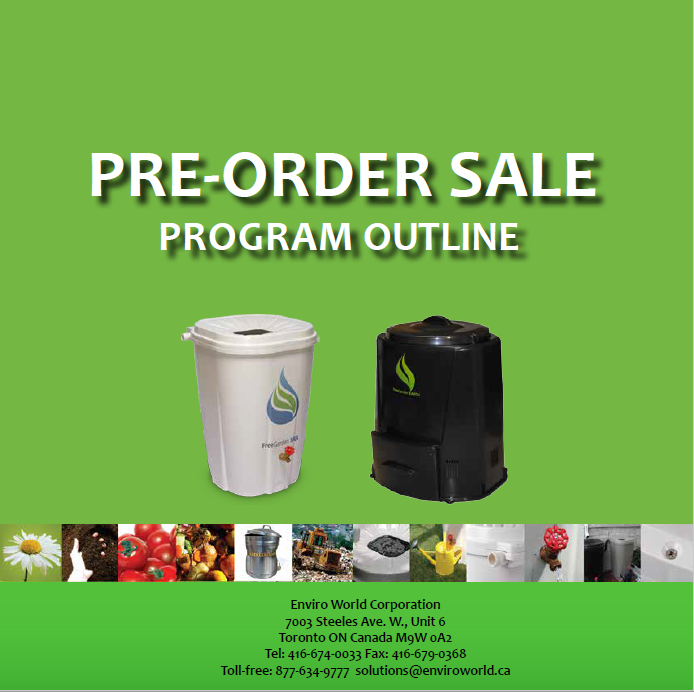 The College/ University can use our sample pre-order sale sheet to collect orders. The payment method can be via cash or cheque to the College/ University or to Enviro World Corporation. The cut off time will be typically 2 weeks prior to the distribution event date and then the corresponding number of products will be shipped to the College/University location. Third step: Distributing the pre purchased product to the students on the proposed distribution event date. Enviro World will donate (Max up to $10 per unit) sold towards the College/ University as a fundraiser for environmental efforts based on the pricing terms and the number of the the products sold.